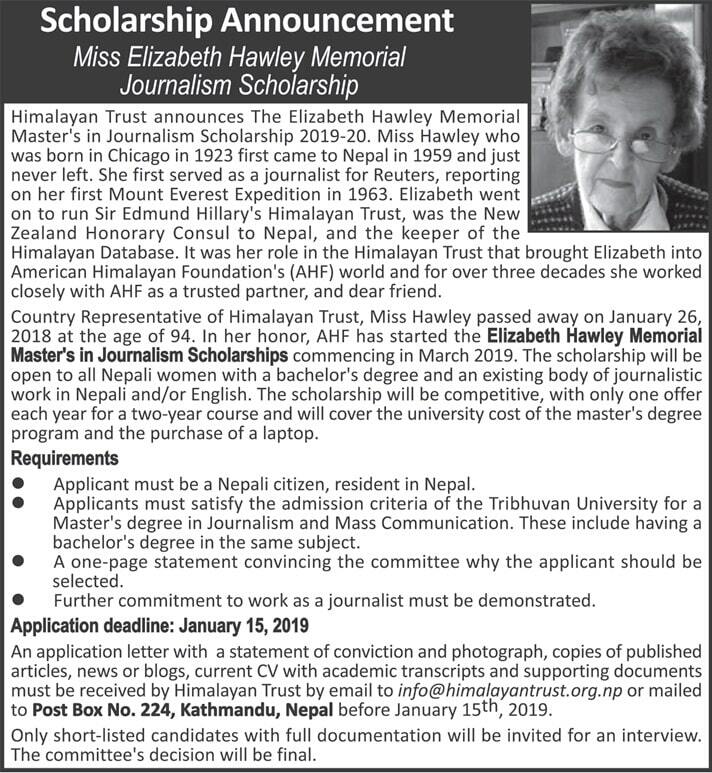 Himalayan Trust announces The Elizabeth Hawley Memorial Masters in Journalism Scholarship 2019-20. Miss Elizabeth Hawley who was born in Chicago in 1923 first came to Nepal in 1959 and just never left. She first served as a journalist for Reuters, reporting on her first Mount Everest Expedition in 1963. Elizabeth went on to run Sir Edmund Hillary's Himalayan Trust, was the New Zealand Honorary Consul to Nepal, and the keeper of the Himalayan Database. It was her role in the Himalayan Trust that brought Elizabeth into American Himalayan Foundation's (AHF) world and for over three decades she worked closely with AHF as a trusted partner and dear friend. Country Representative of Himalayan Trust, Miss Hawley passed away on January 26, 2018, at the age of 94. In her honor, AHF has started the Elizabeth Hawley Memorial Master's in Journalism Scholarships commencing in March 2019. The scholarship will be open to all Nepali women with a bachelor's degree and an existing body of journalistic work in Nepali and/or English. The scholarship will be competitive, with only one offer each year for a two-year course and will cover the university cost of the master's degree program and the purchase of a laptop. Applicant must be a Nepali citizen, resident in Nepal. Applicants must satisfy the admission criteria of the Tribhuvan University for a Master's degree in Journalism and Mass Communication. These include having a bachelor's degree in the same subject. Further commitment to work as a journalist must be demonstrated. An application letter with a statement of conviction and photograph, copies of published articles, news or blogs, current CV with academic transcripts and supporting documents must be received by Himalayan Trust by email to info@himalayantrust.org.np or mailed to Post Box No. 224, Kathmandu, Nepal before January 15th, 2019. Only short-listed candidates with full documentation will be invited for an interview. The committee's decision will be final.